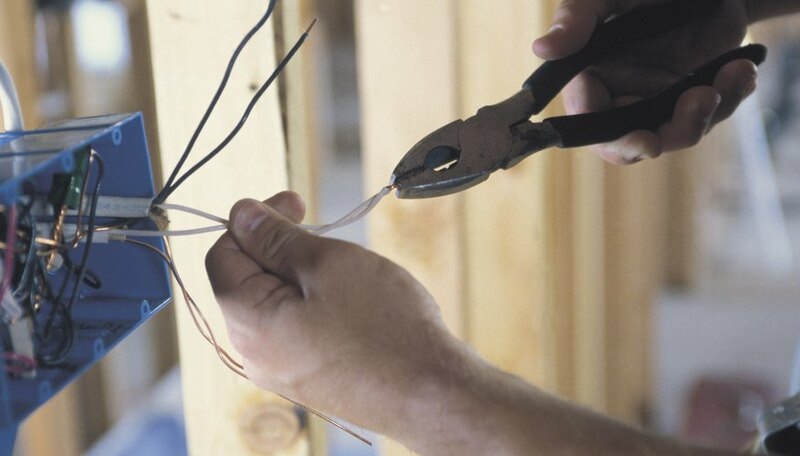 You do not need many parts or much experience to complete simple electrical projects. Easy projects are great ways to learn about electronics and how various scientific principles work. Whether you are a student or a hobbyist, a number of simple electrical projects can easily be created. You can build a simple AC generator with thin wire, a cardboard box, a nail, a few tools and a ceramic magnet. You may also want to use a drill to spin the generator, which is much easier than trying to generate electricity by spinning by hand. Cut the top and the bottom from a small cardboard box so that it is hollow. Put the nail through the center. Wrap the box in fine copper wire. Clamp four magnets around your nail. When the box is spun, it will generate electricity. Hook up a small light to the generator to watch the box power the light. You can build a simple electronic circuit switch with batteries, a clothespin (wood or plastic), copper bell wire, small blocks of wood, a drywall nail, thumbtacks, a paperclip and a 3-volt bulb. Wind the bare end of the wire around the thumbtack and attach the paperclip to it. Press the thumbtack into a block of wood. Wrap a wire end around another thumbtack and push that one into the wood as well. Your switch is complete. Press another tack into the middle of the block to keep the switch from moving. To build a holder for the bulb, nail your clothespin to another small wooden block. Tack one of the loose ends of wire from your switch right under the clothespin jaws. Wrap the other wire end around your bulb. Bend one wire at a right angle and connect to one of your batteries. Do the same with the other battery. It is possible to build a battery from fruits or vegetables. You will need galvanized nails, vegetables (potatoes work well), alligator clips, bare copper wire and a voltmeter. You may also want to use wire cutters. Put one nail into one end of your potato and jab the bare copper wire into the other end. The two ends can be close together inside the potato, but they should not touch. Hook up the nail and the copper wire into the voltmeter to see the voltage of your potato battery. D., Amber. "Simple Electrical Projects." Sciencing, https://sciencing.com/simple-electrical-projects-5758035.html. 24 April 2017.